Former Celtic player Vidar Riseth dubs the club’s board “cowards”, Robbie Neilson insists referee Kevin Clancy got decision to send off Jordan McGhee wrong, and Kane Hemmings is linked with a seven-figure move to China. Former Celtic player Vidar Riseth has labelled the club’s board “cowards” for their failure to properly support manager Ronny Deila. The Norwegian has come into strong criticism this year for a disappointing European campaign and inconsistent league form. However, Riseth believes Deila has been handicapped by the club’s strategy of selling off their best players for a profit, something which he believes they don’t make perfectly clear as their intention to fans and the media. In-form Dundee striker Kane Hemmings is on the radar of Beijing Renhe. 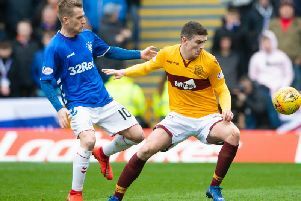 The 23-year-old has netted 18 goals already this term and this has alerted the Chinese second division side, who recently nabbed former Rangers hitman Nikica Jelavic for £2m. St Johnstone are considering installing an artificial surface for their McDiarmid Park pitch. The Perth club have been plagued this season by troubles with the playing surface, which has come under criticism from both opposition and Saints players alike. Hearts head coach Robbie Neilson believes match official Kevin Clancy was wrong to send off defender Jordan McGhee, leaving his side at a one-man disadvantage for a long stretch of their 2-1 loss to Dundee United. Neilson insists he’s looked at the challenge, which saw McGhee receive a second yellow card, and doesn’t think it’s even a foul. Former captain Russell Anderson insists Aberdeen are still very much in the Ladbrokes Premiership title race despite falling six points behind Celtic. Derek McInnes’ side had a real chance to put pressure on their title rivals at the beginning of the week. However, a defeat to Inverness coupled with Friday’s game with Partick Thistle falling victim to the weather has left them trailing behind once more. Falkirk will be without young midfielder Conor McGrandles for the remainder of the season after he suffered a double leg break in their 1-0 victory over Morton. The Hampden Park turf could be a source of embarrassment when Hibs and Ross County meet in the League Cup final next month. The showpiece event will take place in three weeks time and it’s doubtful whether the SFA will be able to sort out problems with the turf before that time. CELTIC manager Ronny Deila said last night that he believed a title win should secure him a third season in charge. The Norwegian has previously accepted he would not deserve to remain in post were the league lost to Aberdeen. A patchy 3-0 win over Inverness Caledonian Thistle yesterday allowed his team to open up a six-point gap over Derek McInnes’s men. With that lead, the subject of his job security could be flipped and Deila was asked if he felt he would deserve to stay on in the event of winning the league. He concurred.